I have a masking course that is running in August 2018 (20th!) and I thought that in advance, I might share some thoughts about rule 3. This is the rule that many people scratch their head over, mainly because it can be difficult to see, but also because it doesn’t come up that often (and generally only in more complex cases). Therefore, if you’re used to testing routine cases you may not have to think about rule 3 very much. That’s why it’s good to refresh your knowledge so that you don’t miss it when it does come along. Completing rule 3 means that your hearing test will be more accurate; the end result may affect your diagnosis and also your hearing aid prescription. How does Rule 1 differ to Rule 3 in masking? We know that Rule 3 is only needed when Rule 1 has not been carried out and that both involve air conduction masking. But why? 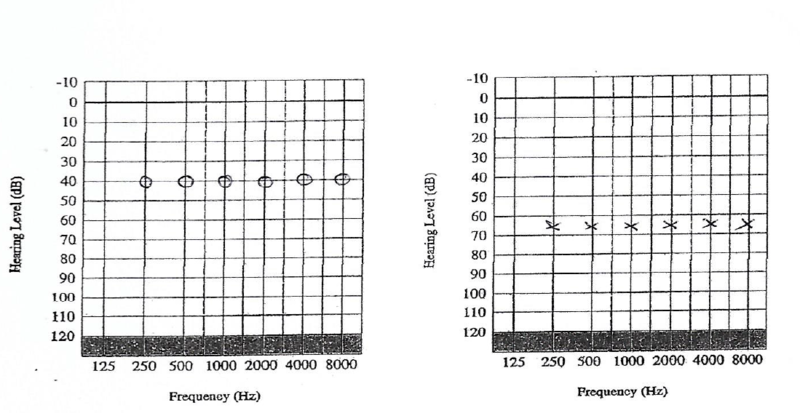 Rule 1 was carried out at all the frequencies as there was a difference of >40 dB at all the frequencies between the 2 ears. Headphones were used and the left ear was the test ear, and the right ear was the non-test ear, to be masked. However, the difference between the two cochleae can be hidden when the non-test ear has a conductive component. Say for example the same patient as above comes back a few weeks later with a hideous cold that has affected his right ear. There was no need to do air conduction masking in this scenario (Rule 1 not required). As the there was an air bone gap of >10dB between the air and bone conduction thresholds (Rule 2), bone conduction masking needed to be carried out at 0.5, 1, 2 and 4 kHZ. The left ear was the test ear using bone conduction, and the right ear was the non-test ear, to be masked. Moderate to severe sensorineural hearing loss on the left. Mild conductive hearing loss on the right. The asymmetry that is present between the 2 cochleae (as you would visibly see in Rule 1) is hidden until you carry out the bone conduction. That is why you only carry out Rule 3 if Rule 1 has not been carried out. Rule 3 is often missed because the BC that relates to the better ear (non-test ear) is recorded on the side on which the BC is placed (worse ear). Therefore you have to think to which ear the not-masked BC belongs to. Although you check the BC to ascertain an asymmetry, you don’t use the BC in your masking procedure – you are masking the AC thresholds only. 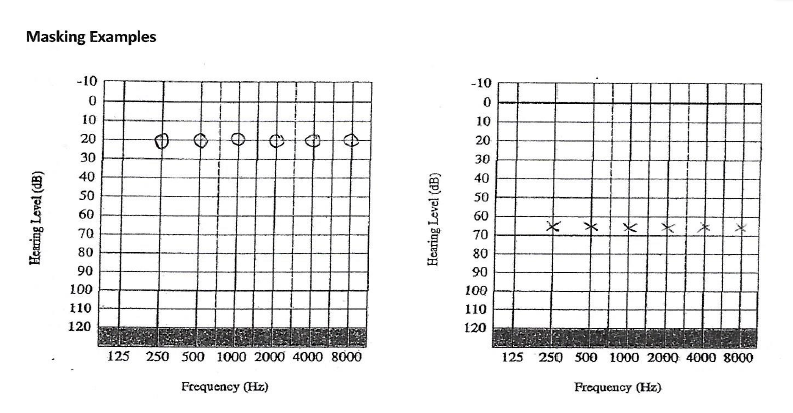 At frequencies where no b-c thresholds have been measured – if there is a possibility that a-c threshold at these frequencies (including 250 Hz and 8000 Hz) are not the true thresholds, they should be masked. A training or refresher course in masking in audiometry will enable audiologists to consider and understand why we need to mask, rather than just learning the rules. TJ Audiology Services uses audiometry simulation software to practice different scenarios, alongside interpretation of working audiogram. The next course is at Newbury College Berkshire on the 20th of August 2018 and in-house or tailor-made course are available. See www.tjaudiology.com or email tjaudiology@outlook.com for details and booking.